The Privateers fell behind 14-2 early and could never catch back up. Although they got back into the game later in the first half, they were blitzed in the second, falling behind by as many as 24 and eventually falling by a 79-61 count. 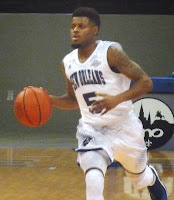 Junior Christavious Gill led New Orleans with 21 points, and Kevin Hill paced the Bucs with 13 rebounds. UNO will quickly turn around and travel to Duquesne of the Atlantic 10 for a Monday night road game.